Super Savings Item! Save 31% on the IKEA LEKA Mobile by Ikea at Wow In The Details. MPN: 50176761. Hurry! Limited time offer. Offer valid only while supplies last. 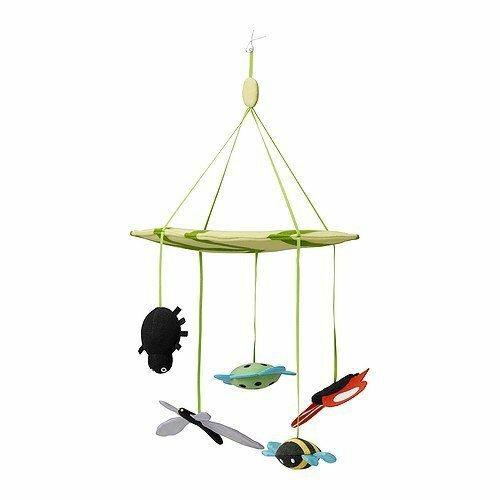 A whimsical addition to any nursery, the IKEA LEKA Baby mobile provides colorful patterns and shapes and whimsical characters for your baby's view. A whimsical addition to any nursery, the IKEA LEKA Baby mobile provides colorful patterns and shapes and whimsical characters for your baby's view. Recommended for newborns to 5 month olds. Polyester materials. Care Instructions: Do not wash. Do not bleach. Do not tumble dry. Do not iron. Do not dryclean. (So, basically don't do anything to it...) Dimensions: Base is approx 10" in Length. Recommended for ages 0-5 months. The downward figures and patterns meet the lying child's upward look.